I could mention that the Nordstrom Anniversary Sale opens to the public tomorrow - but I am guessing that everyone knows that - and for those that have been waiting for the public sale - I hope a lot of popular items - like this striped sweater and this really cozy shearling jacket for only $60 - that sold out almost instantly are back in stock! I will say though that snake pumps are probably my second favorite shoe after my leopard pumps. 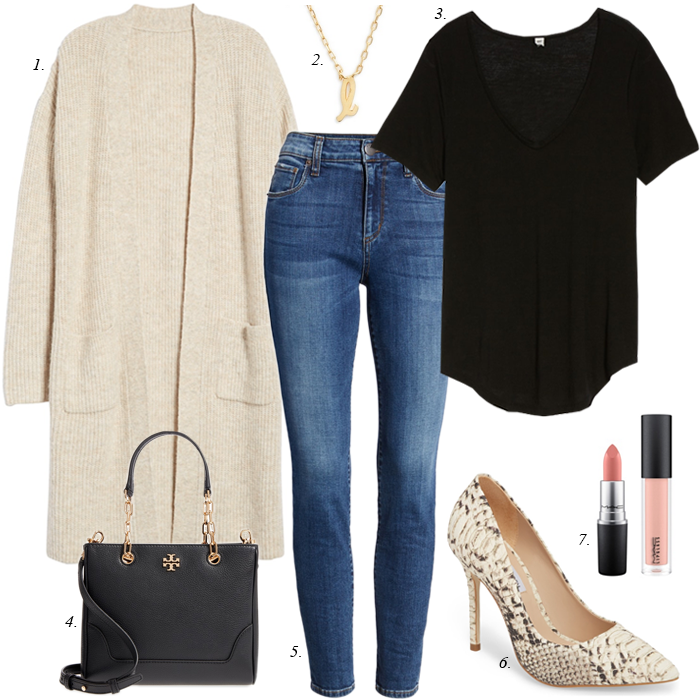 I love how chic and trendy snake print is and how well it pairs with something as simple as a black tee and cardigan. It just adds that finishing touch to a look. I just discovered this textured v-neck sweater that is only $26! I’ve seen this sweater styled two ways - and it’s cute! I love the colors this long cardigan comes in that is under $50. I bought this sweater for $26 - and wore it to work already! These booties are a top pick from the sale! This new arrival floral dress is on sale! This cute flutter top (in a favorite color) is an extra 40% off. If you love the blue and white trend, you’ll love this sweater! This bold floral skirt is on sale for $20. This popular curling wand is on sale and back in stock. This striped shirt dress is on sale for $25 (originally $80). If you are shopping the NSALE tomorrow… be sure to check out these posts. I received my order yesterday and I'm sending two of the 4 items back. I did end up ordering two more cardigans yesterday but I plan on keeping only one. If we had a Nordstrom close by I could shop in person instead of having to try to make decisions between two items at home. Oh well, I think alot of people are in the same boat! I wish I had a Nordstrom close, too - it is so much easier to see it in person and make a decision. Even with reviews, it is hard to really know what it looks like and how it fits online. Can't wait to see what items you kept! Love those pumps! Dang...my size is gone boo. Bummer. They still have my size - but I don't know if I can justify another pair of snake print pumps. OH man! I really wanted that striped sweater too! It was on my wish list and I was going to have a friend order it for me who has early access, but didn't think it would sell out! Darn! It was sold out right away - I shopped a few hours after the sale started - and it was gone that soon! They might re-stock it - maybe.